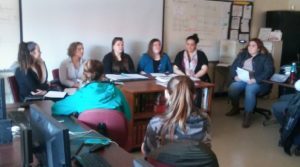 Former Business Academy – Medical Assisting students return to class to speak to this year’s class on their colleges, college experiences, and related jobs. Shown from left to right: Lauren Russell (Mercy Hospital – RN), Celeste Cannafarina (Cardiology – Medical Assistant), Morgan Berry (EMS), Emily Gelinas (student SMCC Medical Assisting Program), Ebony Dukes (UNE student and CNA) and Ali Harris (Saco Family Practice – Medical Assistant). Thank you ladies for your time!